Naso is the longest single Torah portion of the year, 176 verses. However, that’s partly because it includes a detailed description of the gifts presented by each of the twelve tribes upon the dedication of the Tabernacle, and they’re identical, so that’s a lot of repetition. Only the names of the tribe and leader vary. According to Nachmanides, this serves to hammer home that the tribes are innately equal before the Lord and also is a way to honor each leader individually, by name (see A Daily Dose of Torah, Y. A. Weiss, ed., Vol. 9, p. 105). But before we get to those, there are several situations and laws that do not really seem related. However, everything not only ties together but logically follows from what came before. First, we still have to complete the census of the Levites. This one includes only the men aged 30 to 50 this time; since their work includes disassembling and carrying the Tabernacle when the Israelites were on the move, they retire from that duty at 50. Now that we’ve finished talking about the camp, we are reminded that ritually unclean people belong outside it and the offerings required for their ritual purification, which leads to some text about the guilt offering, which is brought for what is referred to as “a trespass against,” or “breaking faith with,” the Lord. Since the same phrasing is used for a wife suspected of adultery, what comes next is the (in)famous), sotah ritual, a trial by ordeal brought by a jealous and suspicious husband. This involves having her drink “bitter waters” and uncovering her hair. concerning nazirites, including abstaining from haircuts, beard shaving, intoxicants and grapes, and not coming into contact with a corpse. Becoming a nazirite was a way to attain a higher spiritual state. This was intended to be temporary, say, 30 days. Famous lifelong nazirites include Samuel, who bore it well, and Samson, born in this week’s haftarah (Judges 13:2-25), who didn’t. But there was ambivalence about this sort of spiritually-inspired asceticism, so what’s next but a reminder of who are caretakers of the Israelites’ spiritual welfare, namely, the priestly benediction (6:24-26). Finally, since we’ve being reading about holiness and dedication to the Lord, the last chapter in the portion includes the presentation of tribal gifts that I described above. The priestly benediction is the most familiar part of this Torah portion. It is part of our liturgy and, at certain times, (customs vary worldwide) is pronounced by the Kohanim in the congregation. That brings me to “An Unbelievably Love-ly Vort” (vort =short insight) from Rabbi Yissocher Frand’s weekly, passed along to me by Arlene (thanks!). The Kohanim recite a blessing before the priestly benediction, which includes “who has sanctified us with the sanctity of Aaron and commanded us to bless His nation Israel, with love.” Giving the blessing with love is a firm requirement. The Italian scholar Rav Moshe Dovid Valle [1697-1777]: wrote, “…and the Torah, by writing ‘amor lahem‘ ( אָמ֖וֹר לָהֶֽם , literally ‘say to them’) implies with great focus and with complete love. And there is a hint in the pasuk [verse] that it must be said with love.” What is the hint? “For the word amor in the language of other nations means ‘love.’” Whether or not there is etymological evidence linking the Hebrew אָמ֖וֹר to the Latin amor, it’s a useful insight, since one can extrapolate it to include every time the Lord issues a command, “…amor lahem” that command is inherently filled with love. We always used to spend Christmas with Grandpa and Grandma. They used to live here in a big brick home, but Grandpa got retarded and they moved to Florida. Now they live in a place with a lot of other retarded people. They all live in little tin boxes. They ride on big three-wheeled tricycles and they all wear nametags because they don’t know who they are. They go to a big building called a wrecking hall; but if it was wrecked, they got it fixed because it’s all right now. They play games and do exercises there, but they don’t do them very good. There is a swimming pool there. They go into it and just stand there with their hats on. I guess they don’t know how to swim. As you go into their park, there is a dollhouse with a little man sitting in it. He watches all day so they can’t get out without him seeing them. When they can sneak out they go to the beach and pick up shells that they think are dollars. My Grandma says Grandpa worked hard all his life and earned his retardment. I wish they would move back up here, but I guess the little man in the dollhouse won’t let them out. 5. Why is drinking like an old coat? It’s a bad habit. 6. Why is a drunkard like a tanner? Because he soaks his hide. 7. A canter will give you ruddy cheeks, a decanter will give you a ruddy nose. 8. What kind of ale does a family of children represent? Homebrood (brewed). 16. “Well, my boy, do you know what syntax means?” said a schoolmaster to the child of a teetotaler. 19. What is a dram?—A dram, generally speaking, is a small quantity taken in large quantities by those who have few grains of sobriety and no scruples of conscience. 30. Why is a vain young lady like a confirmed drunkard? Because she is constantly using the Glass. BEARDS—ONCE ASSOCIATED STRICTLY WITH HERMITS and wizards—have become one of the hottest fashion accessories for men. One British barber and businessman has floated a radical proposal to discourage hirsute faces, or at least make some money off them. Anthony Kent is proposing a UK beard tax; surprisingly, he’s not the first person to have the idea. According to the Worcester News, Kent discovered tales of Henry VIII’s 16th-century tax levied on the bearded men of England, and inspiration struck. Claims that Henry VIII introduced a beard tax in 1535 …seem to be apocryphal. One prolific blogger on the life and times of Henry VIII has noted that … beard-pulling was a crime punishable by fines. After Peter’s triumphant return to Russia…, a joyous reception was thrown in his honor. … Peter unexpectedly pulled out a massive barber’s razor. As biographer Robert K. Massie writes, “After passing among his [friends] and embracing them… he began shaving off their beards” with his own hands! Only the Patriarch of the Russian Orthodox Church was spared. Long, flowing beards were considered a symbol of manhood, integrity, and piety according to Orthodox ideals. Given this cultural preference, Peter turned to taxation; with an exception for priests, men who refused to shave their beards were taxed 100 roubles a year. 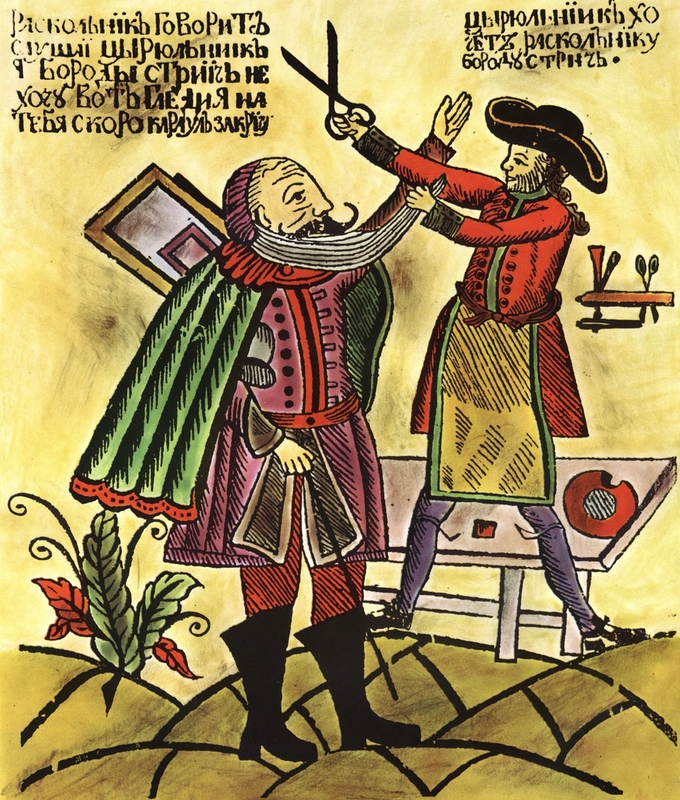 Peasants were only required to shave when entering a city (or pay a fine of one kopek). To verify that a bearded man had paid his tax and did not need to be forcibly shaved (and yes, noncompliant men were forcibly shaved) “beard tokens” were minted and given as proof that the tax had been paid. Peter’s beard tax was abolished in 1772. On Jewish tombstones, you will sometimes see a symbol showing two hands arranged for the Priestly Blessing like the example here. This is a symbol of the Kohen or Cohen (Hebrew for priest). The plural form is Kohanim or Cohanim. Kohanim are assumed to be direct male descendants of Aaron, who was the first Kohen and the brother of Moses. Some Jewish surnames frequently associated with this symbol are Conn or Cohn (Kohn), Cahn (Kahn), and Cohen (Kohen), but you will find the symbol on the grave markers of people with other surnames. Today families can sometimes verify a priestly lineage from the tombstones of ancestors that have this symbol. This entry was posted in Uncategorized and tagged amor, census, jealousy, Kohanim, Levites, Naso, Nazirite, priestly benediction, Rav Moshe Dovid Valle, Sotah, Vulcan salute. Bookmark the permalink.